With the 2007 season already looming large, even before the whole 2006 season is complete the main manufacturers are working hard to find and maintain their strong suits for the season to come. 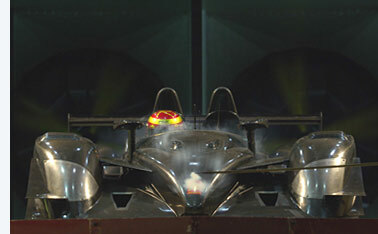 Radical has been in the wind tunnel at MIRA in Bedfordshire (for the very first time) with a full size SR9 - to prove the original concept and to find where progress can be made in the increasingly difficult waters of LMP2 racing. Proof of Radical’s seriousness of intent is that the wind tunnel work has come before 2007 sees the light of day, and judging by the reaction of a very happy Tim Greaves there will be rather more than a 1% improvement to be seen. “It is the first time the full size car has been in a tunnel and the results showed what the car had already demonstrated on track: it is aerodynamically efficient and the aero balance is stable in all attitudes of the car. So the lads from Peterborough are pressing on hard to bring a race winner to the tracks on both sides of the Atlantic.